Some movies make such an impact you remember them for years. They stick with you even as time fades. Sometimes, we see remakes or sequels that nod to the original, drawing on the magic. For me, Jurassic Park was the greatest movie magic ever, giving me a healthy appreciation for an American motor staple, the Jeep. The utility off-road vehicle of choice for this park of dreams was the 1992 Jeep Wrangler YJ Sahara model. Its original color was Sand Beige. 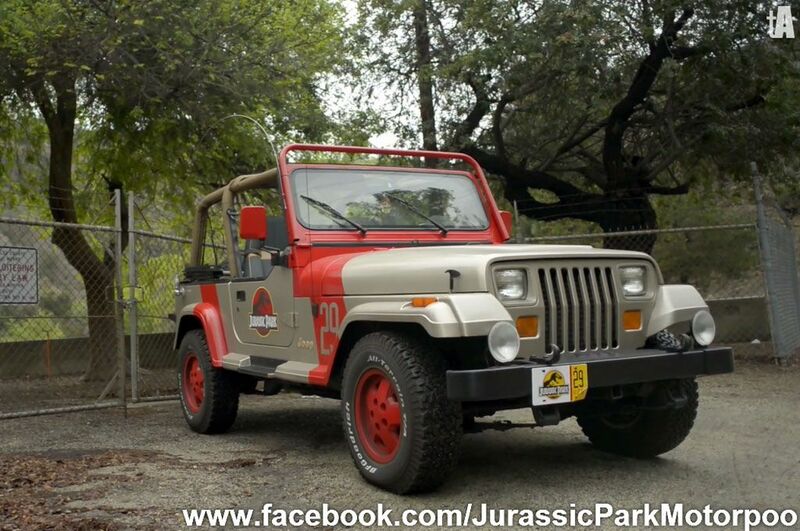 Although this is of some debate to the many restoration projects and fan productions of the Jurassic Park Jeep. Here’s a small breakdown if you’re interested in owning this pop culture icon. Jeeps are notorious for their good resale value, which means a Jeep that cost $15,000 in the 1990s may still be worth a few grand even after so much time. That makes it hard to do a restoration cheaply. On top of the cost of the Jeep, there are some serious costs involved with doing a conversion, including paint decals and other parts needed. Check out Jeep forums for production journals and ideas to work out all the steps needed for a costly undertaking. There’s a case to be made that to do it right, you should use the same Jeep models on the screen. In 1992, it was the only year the Wrangler came in Sand Beige in the Sahara package, so they’re extremely rare. If you find a 1992 Sahara Edition, you have a 50/50 chance of it being the right color. Which makes this Jeep even harder to find. Interestingly, the cloth on the seats and rail guards in this year and model don’t match the ones in the film. Later models do match, but have other issues such as headlight shape. Jeeps were first produced in the 1940s during World War II. After the war, the first models of CJ (Civilian Jeep) were released to the public. Throughout the years the design and construction of the Jeep have changed very little. In 1987, the first Jeep Wrangler (YJ) was released. It was similar to the CJ-7 that preceded it (and shared some parts). The main difference in appearance was the use of square headlights instead of round. The one we’re looking at is a YJ which was produced from 1987 until 1995. Any Jeep produced during that time will give you an accurate square headlight to be turned into a Jurassic Park Jeep. Every year something in the Jeep was improved, so newer is usually better. For example, the 1987 Jeep had a different transfer case that was unreliable. Up until 1991 the engines were carbureted which produced less power than later year Jeeps. In 1992 the roll cage was changed to one that was accurate to Jurassic Park. In 1992 the Sahara package was updated to the green interior that is present in the Jurassic Park Jeeps. The 1995 Jeep (the last year of the YJ) is probably the most refined Jeep, and a good choice, but has some differences from the 1992 to 1994 Jeeps. In the Sahara package, it still has the accurate green seats but lacks a grey dashboard and green center console. The windshield supports on the hood are usually different, and 1995 offered a third brake light above the spare tire. Nothing too major, but some changes would be required. 1995 is the first year of galvanizing the chassis, which means 1995 will hold up better to rust. The 1987-1995 Jeep Wranglers are the only ones that are correct with rectangular headlights. In 1996 for the TJ (and later) they reverted back to the beloved round headlights. 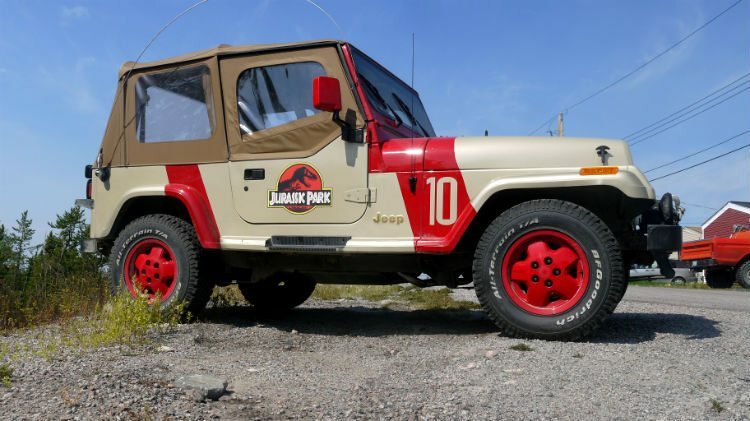 The paint job is an identifying Jeep features with the distinctive red trim and strip containing the beige numbers of the Jurassic Park Fleet. Some of the more predominate numbers include 18 which get the first glimpse of the dinosaurs, and Dennis Nedry takes the dinosaur embryos in Jeep 12. The iconic terrifying chase sequence involving the T- Rex is Jeep 10. Although the ultimate fates of Jeeps 10 and 12 are never revealed, Jeeps 18 and 29 are found years later in the visitor’s center garage by Zach and Gray Mitchell. They repair Jeep 29 and use it to drive back to the main area of Jurassic World, although it’s not clear where it ends up afterward. Jeep 18 is used by Owen Grady and Claire Dearing to hide behind and is shoved into a wall by the Indominus Rex while she is chasing them. Jurassic Park grossed $357,067,947, which, if adjusted for today’s economy is $787,921,400, making it the largest grossing movie of the franchise. 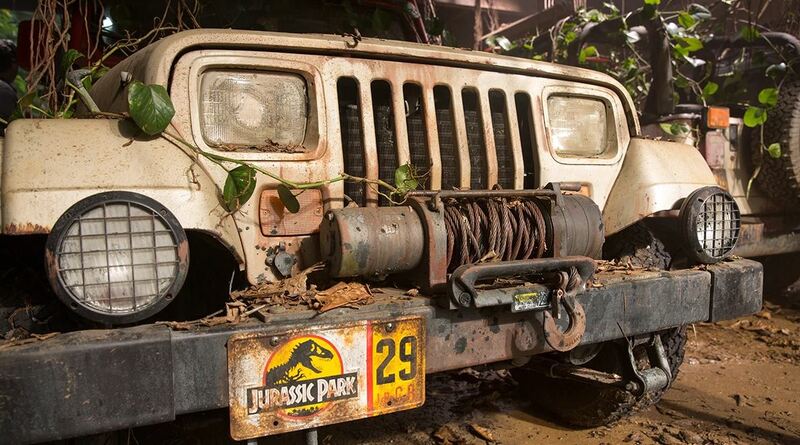 The iconic look of these movie Jeeps is still some of the best movie magic out there. Especially to Jeep fans. Previous What is the Freakin’ J.D. Power Award? Next Which Jeep Is Right for You?